I just love the dramatic look of a drip cake, and in today’s cake decorating video tutorial, I’m going to demonstrate a new favorite- the candy bar drip cake! In this simple cake design, I’ll show you how to decorate an entire tier in chocolate candy bars, as well as how to do a quick and easy chocolate drip. This impressive design is surprisingly simple, and would be perfect for so many occasions from birthdays to groom’s cakes, and even candy-filled holidays like Halloween and Valentine’s Day! 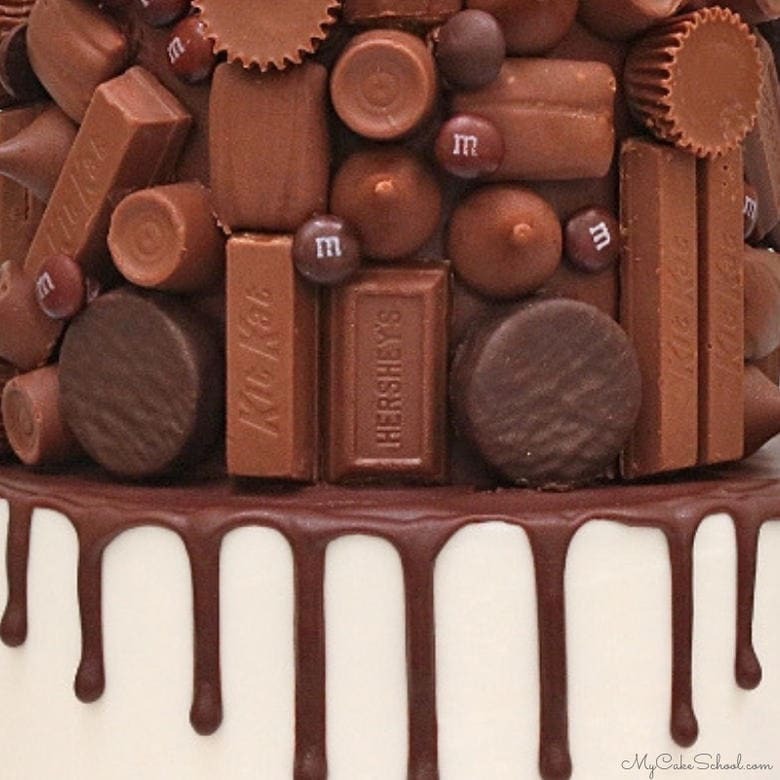 As far as I’m concerned, it’s always a great day for a chocolate cake covered in chocolate candy bars! 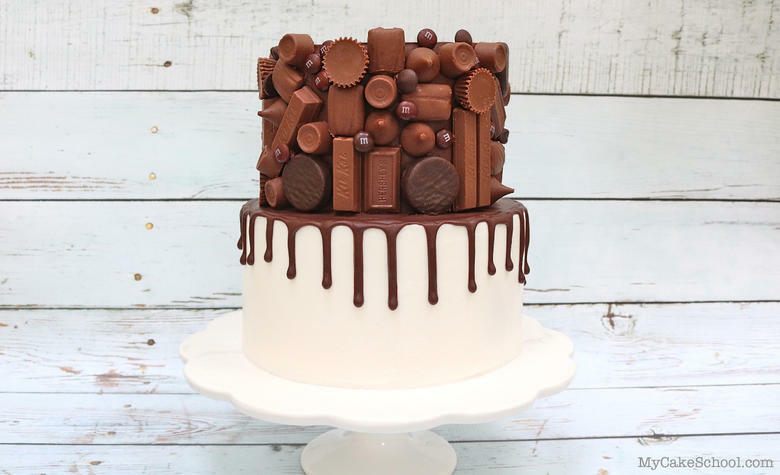 This idea is similar to our cake covered in Kit Kats & Reese’s Cups, but I love the unique look of chocolate candy in so many different shapes and sizes! Variety packs of mini candy bars can be found anytime, but with Halloween just around the corner, it’s an especially good time to stock up! I had way too many candy bars during the making of this cake! We frosted our 6 inch tier with a layer of ganache frosting (2:1 ratio of semi-sweet chocolate to heavy cream). Then, we chilled the tier to firm it up in the freezer for 10-15 minutes. We then added our chocolate pieces to the cake using ganache as our glue. Next, chill the tier while preparing the bottom tier of cake. We frosted our 8 inch tier with Fluffy Buttercream Frosting and chilled for 10-15 minutes in the freezer. Next we applied our ganache drip with a disposable piping bag with the tip snipped away. As I mentioned in the video, we usually use a 1:1 ratio of chocolate to cream for semi-sweet chocolate drips. However, since we already had mixed up a 2:1 ratio of ganache for our frosting, we decided to just warm it slightly in the microwave to achieve a good consistency for dripping. It worked well! After applying the ganache drip to our 8 inch cake, we chilled the tier for about 10 minutes to firm things up. Then, we moved it to our cake pedestal, and added four bubble tea straws cut to the height of the bottom tier for support. 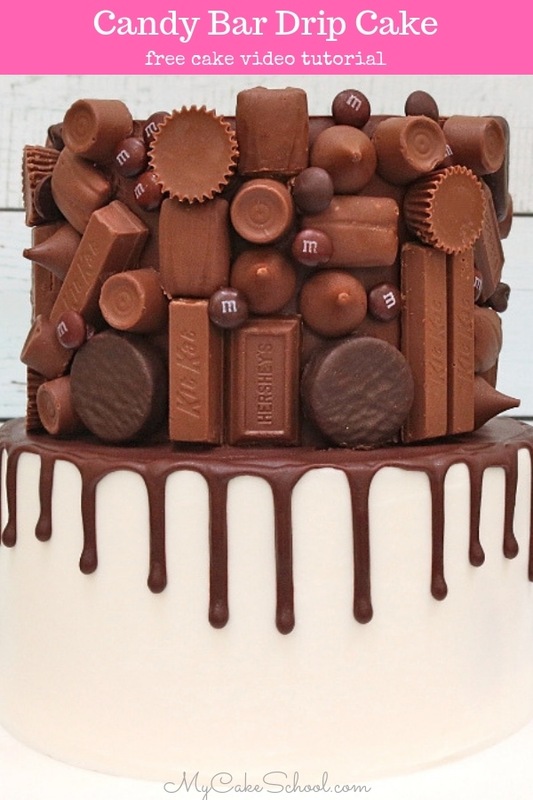 We placed our chilled candy bar tier on top of this, “glued” with a little fresh ganache. Some candy is going to be easier to slice through than others. When I sliced this cake, I first ran my knife under hot water, and then made my slices, removing a piece of candy here and there when necessary. If you’d like, you can line your candy up vertically for easy slicing, much like a Kit Kat cake, but for me, it was no problem! For this cake, we used our Classic Chocolate Cake Recipe, and frosted with a Simple Spreadable Ganache. (2:1 ratio of semi-sweet chocolate to cream). Our 8 inch and 6 inch tiers are each on their own cake cardboards cut down to size. We used 5 bubble tea straws beneath the top tier, cut to the height of the bottom tier. Ganache – We used a 2:1 ratio of chocolate to cream. In this case, we used 20 oz Ghirardelli Semi-Sweet Mini Chips, to 10 oz heavy cream and it was enough to fill both tiers, frost the top tier, and create a drip. To make the ganache, we placed the chocolate and cream in a microwave-safe bowl, heated for one minute, stirred, heated for 30 more seconds, stirred until it came together with no unmelted pieces. (Repeat heating in small increments and stirring if needed until it’s ready). The ganache thickens as it cools. Mini candy bars- Use whatever you like. We had a variety pack of candy bars– we used Hersey’s Kisses, mini Hershey bars, Rolos, mini & standard size Kit Kats, a few M&Ms, Almond Joy, Twix, mini Heath bars, Peppermint Patties, Chocolate Chips. All sorts of combinations of chocolate candy would look good- don’t feel that you have to use as many types of candy as we did. Supports/Bubble Tea Straws- We used 5 bubble tea straws trimmed down to the height of the bottom tier to support the upper tier. More Favorite Chocolate Cakes for the Chocolate-Lovers in your Life! We hope that you enjoyed the video! Here are a few more favorite Chocolate Cakes from our Recipes Section! Learn How to Make and Decorate Cakes Online with My Cake School! If you enjoyed this video, don’t miss our other Free Cake Video Tutorials located in our Free Tutorials Section! We have so many creative, simple, cake designs to share! Who are the lucky people that get to eat that fabulous cake?? Wow!! Must make!! The cake is amazing. Thanks you! Hi Karin, The bottom tier of the cake has 3 layers that are filled and the top tier is 2 six inch filled cake layers. Our Classic Vanilla and Classic Chocolate buttercream recipes use only butter, the recipes are in our recipe section. You could also use your favorite vanilla and chocolate recipes.